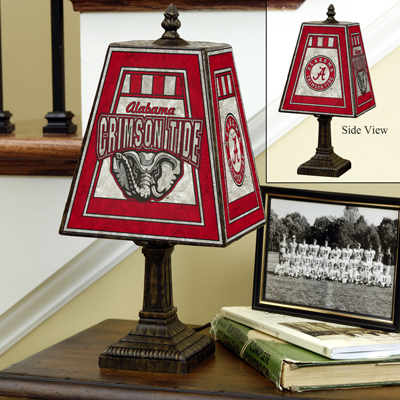 Light up any room in style with this officially licensed Alabama Crimson Tide art-glass table lamp from The Memory Company®. This table lamp is made of hand-painted art glass lamp shade displaying the team colored logo accented with the authentic colors of the team on the front and the team name also with the primary colors of the team on the back. This classy lamp sits on a brass-based basin.